Agatha Christie’s novel Hallowe’en Party, the 39th outing for Belgian detective Hercule Poirot, was first published In November 1969. 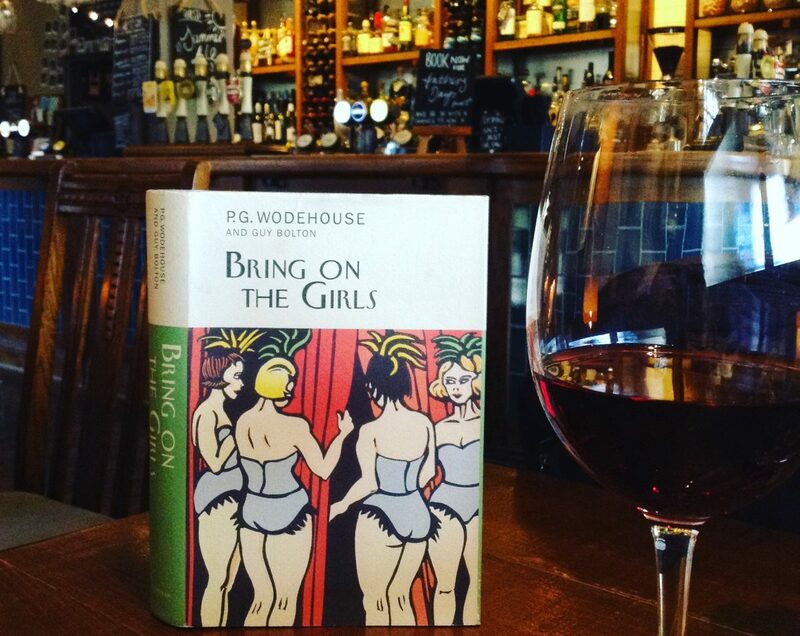 To P. G. Wodehouse — whose books and stories have brightened my life for many years. Also, to show my pleasure in his having been kind enough to tell me he enjoyed my books. In February 2015, many of Agatha Christie’s letters were published to mark the 125th anniversary of her birth. They included a letter from P.G.Wodehouse, thanking Christie for the dedication. Wodehouse and Christie were mutual admirers of each other’s work, and had begun corresponding fifteen years earlier, although a 1955 letter from Wodehouse to his friend Denis Mackail shows their relationship got off to a rocky start. …I’m seething with fury. Sir Allen Lane of Penguin was over here not long ago and told me that Agatha Christie simply loved my stuff and I must write to her and tell her how much I liked hers. So with infinite sweat I wrote her a long gushing letter, and what comes back? About three lines, the sort of thing you write to an unknown fan. ‘So glad you have enjoyed my criminal adventures’ – that sort of thing. The really bitter part was that she said the book of mine she liked best was The Little Nugget –1908 production. And the maddening thing is that one has got to go on reading her, because she is about the only writer today who is readable. But as Wodehouse himself wrote, in ‘Strychnine in the Soup’ (Mulliner Nights): “There is no surer foundation for a beautiful friendship than a mutual taste in literature.” Despite this inauspicious beginning, Wodehouse and Christie continued corresponding until the early 1970s (Wodehouse died in 1975). As prolific and popular writers, they had much in common. They discussed their methods, their work, and in later years, their ailments. I often wonder how you write, — I mean do you sit upright at a desk? I ask because I find these days I can’t get out of an arm chair and face my desk, and when I write in an arm chair I have the greatest difficulty in reading what I have written. This may be because I have a deckchair, a Boxer and one of our seven cats sitting on me. But oh, how I have slowed up. It’s terrible. 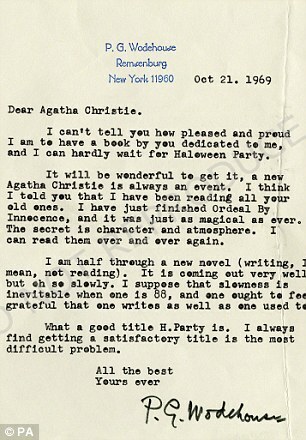 Agatha Christie’s letters to P.G. Wodehouse are contained in the Wodehouse archives, which I was privileged to view in 2016. Among the treasures I discovered during my visit, was a letter from Agatha Christie dated 15 October 1969, telling Wodehouse of her dedication of Halowe’en Party to him. Other letters from Christie recount her pleasure on finishing a novel, frustrations with proof readers’ corrections, and her delight that their waxworks were ‘…sitting side by side in Madam Tussauds’ in 1974. These letters, many of them handwritten, were among the Wodehouse archives acquired by the British Library last year. This will be welcome news for Wodehouse readers who are also fans of Agatha Christie – of whom there are many. A 2014 poll in the Fans of P.G. Wodehouse Facebook group suggests Agatha Christie is the Number 1 author Wodehouse lovers read when not reading Wodehouse. I am happy to count myself among them. I started reading Agatha Christie in my early teens — a natural progression from Enid Blyton’s Famous Five series, which I had collected and read many times over as a child. By the time I encountered my first Wodehouse story, in my 21st year, I had a solid grounding in the culture and era in which he wrote, and the crime genre he so admired (which he often incorporated into his work). Having also read my allotted share of Shakespeare and Chaucer by this time, I was not frightened by the complexity of Wodehouse’s style, or his extensive literary, classical and biblical references. Agatha Christie needs no endorsement from me — she is the top selling novelist of all time. But I particularly recommend her books to people wanting to prepare younger readers for enjoying Wodehouse at a later age. Of course, I shall take it as read that some of you were child geniuses, devouring Wodehouse novels from the age of five, and that your own child began (under your expert tutelage) to read Wodehouse — and possibly Shakespeare — in the womb. Top stuff, old Bean! However, the average modern child is likely to be thoroughly put off Wodehouse, whose writing is more complex than he’s given credit for, if it’s thrust upon them too soon. I suggest these wilderness years can be productively spent reading Agatha Christie instead. Murders are not as uncommon as you might think in the often gruesome world of Young Adult fiction. Unless your prospective younger reader is particularly sensitive, they may well appreciate the central murder in Hallowe’en Party — of a boastful thirteen year old called Joyce, during a children’s party. Christie also created some terrific young heroines, try Cat Among the Pigeons, and The Secret Adversary. When the time comes to move on to Wodehouse, the adventures of Joan Valentine in Something Fresh, and Eve Halliday in Leave it to Psmith, will make great places to start. In fact, I think I’ll finish with a dash of Joan Valentine and Ashe Marson now. To set the scene for you, Ashe is struggling to come up with a plot for his new mystery story, which he has decided to call ‘The Wand of Death’, when he is interrupted by a girl (Joan Valentine). Ashe could not restrain his admiration. She looked at him with interest. Ashe felt like one who meets a boyhood’s chum on a desert island. Here was a real bond between them. May all your pumpkins be prize-winners this Halloween. Super kind of you to say so. Thanks! Good stuff, Honoria. We missed you in D.C. Whatever that stands for. What Ho, Ken. I was distraught to miss D.C. It looked like a terrific binge. Ken starred as MC. Whatever that stands for. Delightful! I appreciate your help in introducing Plum to the young. I shall try this with my daughter. She is into fantasy fiction. It would be my job to convince her that Wodehouse is fantastic! Good luck Prabha. I can also suggest Robin Stevens, who is a modern YA crime writer with great heroines. My daughter loves her. I love Agatha Christie’s books, and I have almost all of them. The books with Lady Eileen “Bundle” Brent make a particularly good bridge to PGW, I think. I would also recommend Patricia Wentworth’s Miss Silver mysteries, as being of a Christieish ilk, if perhaps a slightly different flavour. Thanks Deborah. I will definitely give Patricia Wentworth a try. I think |I’d like to grow up to be Joan Valentine. The enduring heritage of both Agata Christie and PGW combined, can be seen and appreciate (IMO) into Alan Bradley’s Flavia De Luce saga. Just look at titles, such as A Red Herring Without Mustard, and you know where you are. And happy to be. Wonderful post, Honoria. This evening I will drink a toast to you with a glass of Touraine Sauvignon! And Cheers to you also, George. I shall look out for A Red Herring Without Mustard. That’s certainly my kind of title! That sounds like a ditty to put a spring in one’s step. Me too, Virginia. I love the old, well-thumbed paperback editions, which are so portable — perfect travel companions. . Thank you for knitting together my tangled memories of P.G. Wodehouse and Agatha Christie in their shared world. It is my pleasure. Thanks for reading!